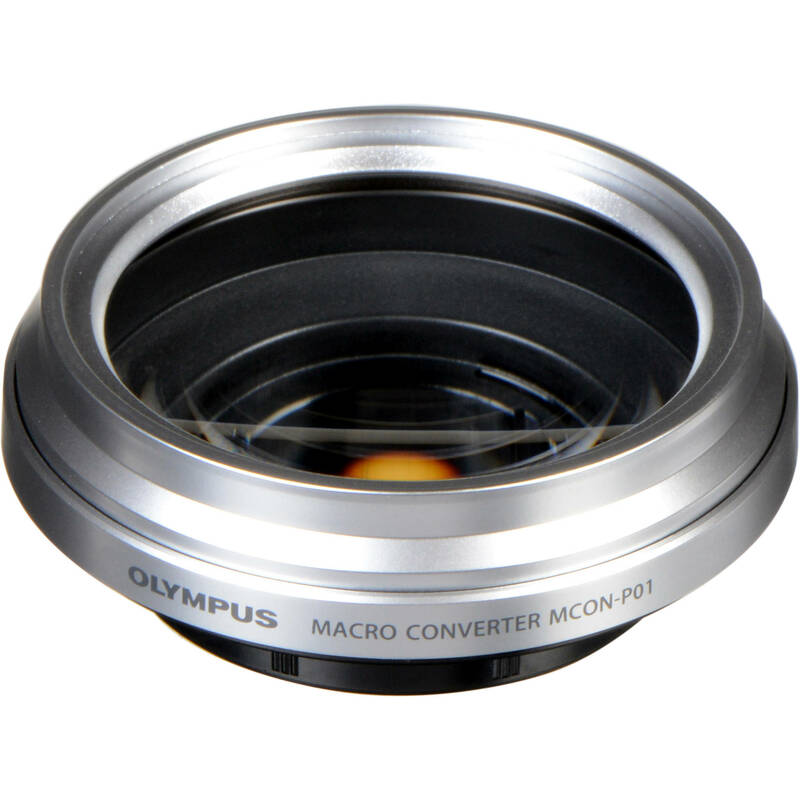 The Olympus MCON-P01 Macro Converter was especially designed for use with the Olympus PEN Micro Four Thirds cameras. When used in combination with select M.Zuiko lenses, various levels of magnification are achieved. For instance, using the MCON-P01 with the M.Zuiko Digital ED 14-150mm lens will yield a magnification of 0.4x with Micro Four Thirds and 0.8x for the 35mm format. The MCON-P01 helps you capture a detailed view of all small, fascinating subjects. Whether you're into photographing stamps and jewelry, or you simply want to take a closer look at the world around you, this converter lens is an economical addition to your PEN, or otherwise compatible set-up. Box Dimensions (LxWxH) 3.5 x 3.4 x 2.6"
MCON-P01 Macro Converter is rated 3.9 out of 5 by 28. Rated 4 out of 5 by James G. from Worth The Money I needed something to get a little closer to subjects that I use in articles I write and this macro converter works well for that. At low f stops there is very little depth of field so a flash is necessary if you want to use a higher f stop indoors. Bottom line is that for the money I feel it's a good buy. It certainly won't take the place of a full blown macro but then again it doesn't cost four to five hundred bucks either. If you use it on a 14-42 Olympus R series lens you will need a MA-PO1 adaptor. For the 14-42mm II lens the correct adaptor is already installed on the macro converter. It is a bayonet mount that twists right on the end of the lens with a positive click. Rated 4 out of 5 by Winifred from Works for Me The MCON-P01 makes my Olympus 14-150 into a very useful macro lens. It's not as crispy clear as a dedicated macro lens, but it does a really nice job. On the 14-150, the focusing range (7 from the end of the lens) allows you to be far enough away to make this a useful macro lens out in the field. (In comparison, subject is about 2 from the front of the 12-50 in macro mode.) Need to atttach this to a telephoto lens (150mm) to get good macro effect. Rated 5 out of 5 by EagleEye from Does the job nicely...superb value I've only snapped a few things with this lens converter, but it was enough to impress me. I'm always fascinated by the macro world, often taking close-ups of flowers or a bee pollinating one, but I could never get as close as I wanted. Cue this converter. It clicked on perfectly on my E-PM1 and, as you can see by the two pics I've put on here, does the job quite nicely. While it will never duplicate what a proper macro lens can do, for $ bucks, it offers a great compromise for value and performance. I'm just someone who likes to take nice pictures, and this made an excellent addition to my kit.Only drawback I can think of is that you are unable to mount it with filters, as with any lens converter, but that's part of the deal. Fortunately, being a graphic designer and Photoshop user, I can simply tweak the resulting photo in RAW format to my liking. Rated 4 out of 5 by Jim from Worth The Money For the money, this is hard to beat. The depth of field is very shallow at the low f stops so I would recommend shooting at somewhere near f8. This won't replace a full blown macro for detail but image quality is acceptable. If you do a lot of macro work I would get the Oly 35mm macro and a lens adaptor instead. If you are going to use this macro converter on a 14-42mm II R lens, you will need the MA-PO1 adaptor. Was told this by an agent at Olympus. Rated 2 out of 5 by Zolton from Will not replace a dedicated macro lens The macro convertor was tested on a M.Zuiko Digital ED 14-150mm f/4.0-5.6 Zoom lens. The Pros: Small, inexpensive and easy to install and use. The cons: Not any better then other close up filter type lenses. Do not expect to produce close up images that will enhance your creativity. The chromatic aberrations were quite bad, and made many of the photos unusable. Save your money and purchase a dedicated macro lens, even a used and inexpensive off brand lens would produce better images. Rated 4 out of 5 by Photowala from Extras for the PEN The primary point for Micro 4/3ds is that they are so much smaller and lighter than full frame SLRs. This becomes another light and small accessory that does expand the Olympus Pen system. I use this on a 14-150mm M Zuiko Lens. It does not fit the 17mm lens. Does its job admirably. Rated 4 out of 5 by Anonymous from The MCON-PO1 Macro Converter I love how handy it is and I was quite pleased with the result when I attached it to my lenses. Slight chromatic aberrations but negligible. For the price, you can't go wrong. Rated 4 out of 5 by selfishbrat from Great with the 40-150mm Although this macro conversion lens can be attached to the olympus 14-42mm MKII, it works best with the olympus 40-150mm. Considering it's less than a 15th of the cost of the panasonic 45mm f2.8, it's a steal. The only problem is you can't attach filters while this conversion lens is attached to your main lens. Do note that with this conversion lens attached, the focusing distance of any lenses you use are limited. does this lens work with the OLYMPUS PEN E-PL5? Yes, very well thank you! Is this designed to work with the 14-150 version 2 ? I have a 14-150 lens , but i dont kwon if this is versin 1 or 2, im Sorry . I am new to all of this, so help would be appreciated. We have Olympus em 10 and the 14-42 mm pancake kit lens. We're about to buy the 40-150 f/4.0-5.6 R Lens as well. I would like to buy a macro converter for close up nature pictures. Am I better off with the MCON-P01 to use with the 40-150, or MCON-P02 to use with the 14-42? Personally I would use the P01 with the 40-150. I feel like I would be a little too close with the 14-42. I shoot a lot of flowers and sometimes the bloom I want isn't on the outside of the patch. Personal preference though. I think you'd be fine either way. it seems is not compatible whith EZ 14-42mmm pancake?